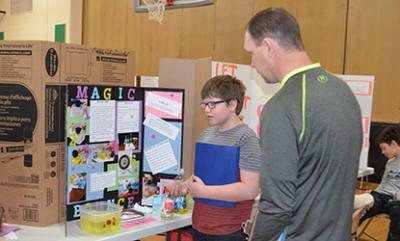 Students at Glencoe-Silver Lake Lakeside Elementary hosted their annual science fair Friday, with judging throughout the day and a public viewing at the end of the school day. Above, Trevor Arredondo explains his project, “Magic,” to judge Ryan Freitag. Submitted by admin on Wed, 03/01/2017 - 11:26am.